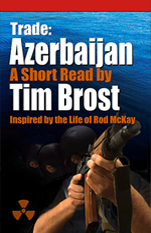 Trade Azerbaijan will be an Amazon Short Read, just over 30,000 words long. It exists in time between Trade Bangkok and Trade Bishkek (not yet released). I was often concerned while conducting background research for this book. But take heart. As of this writing we’re all still in good health. Tuck (Web) Webber is supported by counterterrorist teams as he negotiates to keep deadly material out of the hands of unauthorized buyers. Though a work of fiction, the reader will recognize elements of truth built upon investigation. At the very least, Trade Azerbaijan is an exciting read. The sky over Bangkok is dark. Rain pours here like no other place Tuck Webber has ever been. Tallis is behind the wheel of their company Range Rover. Brick rides shotgun, occasionally wincing, arm in a sling to isolate his shoulder. It’s the first day since the rescue mission that Web has spent any amount of time with his operators. He feels indebted for all they’ve done, and continue to do, to keep his team in Thailand safe. As they ride, Web sits in the back seat, quiet, almost sullen. The vibration of the road below him, and the steady rhythm of windshield wipers battling a steady pounding, has a strangely calming effect. It’s not enough. Web’s nerves are still worn raw from a lengthy meeting he had earlier in the day with General Phang and a dozen of his lieutenants and technicians. As Web gazes through bulletproof glass at dense Bangkok traffic, often barely visible even a few yards away, he reflects on how his wife Samantha is struggling with recent events. “You decide yet, boss?” Tallis asks. “That’s why I called a meeting. Let’s talk then,” Web says, and closes his eyes, effectively ending the discussion. Except for the downpour, they ride in silence. Four days earlier, the team stood in the furious light of a funeral pyre. It was their way of honoring a much-loved friend and colleague, one of the most valued members of the team. Afterwards, they did their best to heal the pain of loss with stories and laughter. For some, especially for Brick, Web knows the loss will take much more time to overcome. Their SUV turns into Don Muang airport and approaches a new guard shack. Since their cover was blown, their gray man approach of blending into the population has been replaced with a hardened perimeter and Thai guards. The building is known now, subject to possible insurgent attacks at any point in the future. Guards rest in vehicles, others huddle beneath temporary green awnings, shielded in part by stacks of sandbags. A rail barrier is raised and their Range Rover is waved through. They decide to drive around the building and enter the hangar. Inside, they are buzzed into the command center. At first glance Web feels like nothing has changed. UAV pilots still sit at their workstations. Technicians manage flight controls, server balls and massive streams of data showing street corners, river landings and highway tollbooths across Bangkok and the country. Rich looks up from the control panel on the command and control riser. He continues to route the ever-growing flow of information. On display, the video wall shows aerial views of coastal areas, busy intersections and urban streets. Web sits heavily and asks for coffee. Rich sends a tech to the office. “Everyone here?” Web asks. “Can’t think of anything,” Patch says. Web inches his chair back. He speaks directly to his partner. “I need you to carry the ball again. Wherever we end up, I want higher operational security and for all of us to be together. Think about some kind of compound, rather than billeting in apartments or condos. Maybe we pay a little extra and get the top floors of an apartment complex. The general has plenty of properties that might work. “More important to me, when are you coming back?” Patch asks. Web stands, turns his back to the table and faces the video monitors. He checks his watch and asks that they all get on with it. For the next hour he addresses everyone on the team, thanking them again for their dedication and commitment and reviewing where the corporation has been and where it is going. A round of applause is given to Lee, James and Anish. Like Brick it is their first day back on the job. Following days of captivity in the hands of secessionist insurgents, Web made decompression mandatory. They’ve been allowed to visit the op center whenever they wished, but they’ve each also had to speak daily with a counselor Web flew in from the States. From nightly reports, Web believes these men will rise above the physical and mental ordeal they suffered in the Sathorn Unique Tower. When the meeting ends, Web tours the facility with Patch one last time, discussing the complications Patch and the team will face during the move. Every tool is in place. Work tables are clear and floors are spotless. “Sorry to bail on you like this,” Web says. They stand in the center of the open hangar near the parked Range Rover. Even in this rain, they prepare to launch another UAV, a test of rain fade and optics. Web returns to the Oriental Residence where he and Sam have stayed since the rescue operation. They eat in the open air at Suan-Lum Night Bazzar and then spend then walk arm in arm one last time through Lumphini Park. They take a seat on a park bench so Web can quickly check email. Among the many messages about business decisions he’s relegated to his brother Sonny, Web notices a message from Sotheby’s. A regular customer, Web gets department notices on various collectibles. A suit of Maximilian jousting armor, made by one of the most famous armorers of all times, Kolman Helmschmied, is up for bid. It was made in Augsburg Germany, circa 1510. He inspects photographs sent in a link. “Check it out,” he says, and holds out a photo of the armor. Sam takes his phone and looks at what to Web is a remarkable find. She regards it with casual interest. 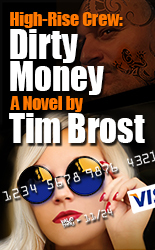 High-rise Crew Dirty Money is the first publication in the High-Rise Crew Trilogy. 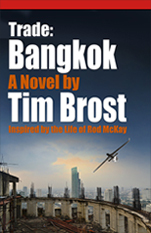 Trade Bangkok is the first book in the Trade Series. Trade Azerbaijan exists in time between Trade Bangkok and yet to be published, Trade Bishkek.